Shalom, chaverim! 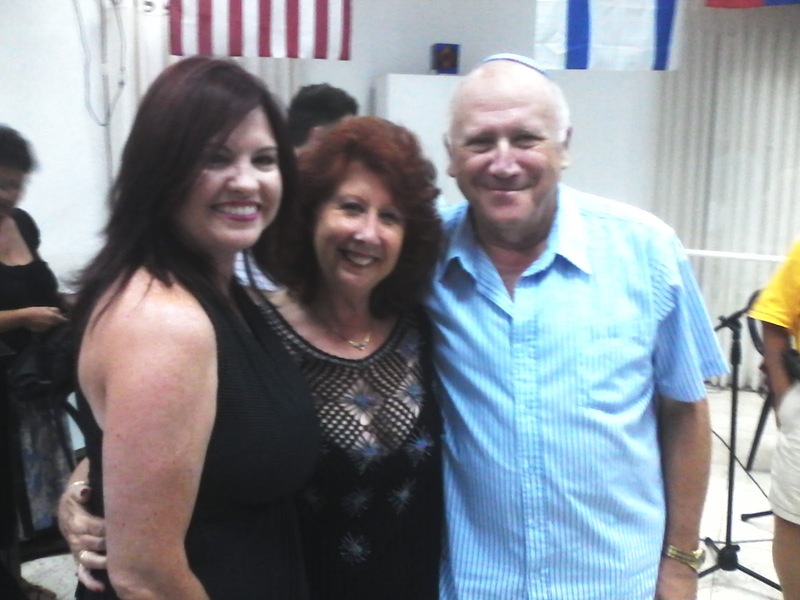 Yesterday was Tu B'Av, a holiday celebrated in Israel to honor matchmaking and romantic love. In some ways it's similar to Valentine's Day--minus the Catholic saints of course. To celebrate, I had been asked to perform in a concert at a local Reform/Progressive synagogue, Congregation Emet ve Shalom (Truth and Peace), along with a number of very talented musicians. This past week has been a bit hectic, between continuing the job search and preparing for the concert. The concert had an interesting format. Alternating between selected biblical stories about love, read aloud, were selections of love songs performed by the artists. My responsibility was to perform four songs, so I chose one in Hebrew and three in English, but since the mood for the concert was a light one, I picked several old jazz standards. This was a big shift for me as a musician, as I have never, ever performed any jazz songs. The song in Hebrew--folk, not jazz by the way--was "Chorshat Ha'Ekaliptus," which Elul called, while he patiently endured my interminable practice sessions, "My Horse Shat a Eucalyptus." Oh ho, the fun we have around our house...it's just like the Algonquin Round Table. I have been searching for local musicians with which to form an ensemble ever since we got to Israel, but still haven't found anyone. As I had no accompanist, then, my solution was to buy karaoke backing tracks online, burn them to a CD, and have them played over the audio system for the performance. Jazz standards being what they are, the songs left large gaps for instrumental solos. In a live performance, of course, the singer can step aside and the audience can turn its attention to the other musicians. But in this case, there wasn't much to look at except at Omar--the man running the mixing board. I had to get creative. On "Dream a Little Dream of Me," I filled the space by bizarrely dancing with a large teddy bear, and during k.d. lang's fabulous tune "Miss Chatelaine," I threw handfuls of fake flower petals at the audience. I figured if I couldn't wow the audience with my singing, at least I could lean on some cheesy props for a laugh. K.d. lang, of course, has performed "Miss Chatelaine" in a lemon chiffon ballgown, complete with boa and bubbles, but I couldn't quite pull that off. Mr. Teddy Bear, my dance partner. At least he didn't talk too much or step on my toes. Pini, ever jealous, inspects Mr. Teddy Bear's collar for lipstick during the photoshoot. Emet ve Shalom's Argentinian rabbi, Israel "Teddy" Horowitz, also happens to be a Cantor as well. 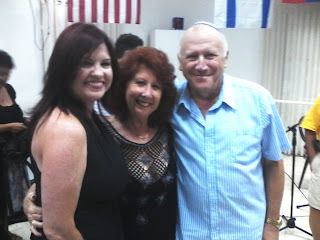 He did a wonderful job, singing songs in Hebrew, Spanish, and even tackled the Beatles' "Yesterday" in English. I was far too chicken to even attempt anything in Spanish, so my hat goes off to Rabbi Teddy. He also performed with a very talented group of instrumentalists called "Conjunto Dorot," comprised of a lovely violinist and two excellent classical guitarists. Another highlight of the show was the appearance of Marta Shumacher, an Argentinian cantor who sings at a Reform synagogue in Karmiel. The renditions of her songs, in Hebrew and Spanish, were heartfelt, beautiful, and deeply moving. There was a good turnout, too--I would guess that more than 70 people paid good money to come to the concert and support Emet ve Shalom. Rabbi Horowitz, Cantor Shumacher, and me, enjoying the post-concert high. See that crazed grin on my face? That's what sheer and utter relief looks like. After the concert, it was time to transform from Cinderella (in my brand-new dress, newly-painted fingernails, and salon-styled hair), back into Shlepping Selah, hauling my teddy bear, music and karaoke CD's back home. Well, not back home directly, exactly. Elul and a friend of ours did stop by Nahariya's "Murphy's Bar" for an after-concert drink, which felt very show-businessy and glamorous, even if the place was practically empty, had unisex toilets and was attached to a bomb shelter. Based on last night's performance, I've decided that for my next Hanukkah present, I'm going to ask for prescription contact lenses, because at my age, I'm starting to need reading glasses just to see the music! Somehow I don't think Beyonce Knowles will be wearing reading glasses on stage when she gets to mid-life. I was supposed be there the other night and I am so sorry I missed your performance, your new dress the nails and apparently so much more. I was busy having a small but, somewhat emotional nervous breakdown! I would have loved to see you performing and dancing with your Teddy Bear....next time! !